While working with Cloud Connector , I faced difficulties to look for some guidance in a single place to refer. Hence, decided to put everything here as a Guide Book for the Beginners which includes the installation steps, post installation configuration and developing a simple application. SAP HANA Cloud connector connects between on-demand applications in SAP HANA Cloud Platform and existing on-premise systems. The Cloud connector runs as on-premise agent in a secured network and acts as a reverse invoke proxy between the on-premise network and SAP HANA Cloud Platform. On-premise systems and resources (HTTP or RFC) that shall be accessible by cloud applications. In order to establish connectivity from SAP HANA Cloud Platform to an on-premise system, the firewall of the on-premise network does not require to open an inbound port. The Cloud connector supports HTTP and RFC protocols as of now. For example, the RFC protocol supports native access to ABAP systems by invoking function modules. The Cloud connector is easy to install and configure, that is, it comes with a low TCO and fits well to cloud scenarios. SAP provides standard support for it. This document illustrates the step by step installation process of Cloud connector 2.x on Microsoft Windows OS. Below are the prerequisites for successfully installation of Cloud Connector 2.x. 64-bit operating systems: Windows 7, Windows 8.1, Windows Server 2008 R2, Windows Server 2012, or Windows Server 2012 R2. Cloud connector installation archive from SAP Development Tools for Eclipse. Microsoft Visual Studio C++ 2010 runtime libraries. Environment variable for <JAVA_HOME> has been set to the Java installation directory, so that the bin subfolder can be found. Download the msi file from “SAP HANA Cloud Connector” Section. Double click on the <sapcc-<version>-windows-x64.msi> installer file. Having downloaded the cloud connector MSI installer to start the installation by double-clicking the MSI. Afterwards it will be welcome by the installer. Navigate to the installation directory for the SAP HANA Cloud connector and choose Next>. Port can be chosen on which the administration UI is reachable. Either leave the default 8443 or choose a different port if needed. Then choose Next>. On this step, decide whether the Cloud connector should be started immediately after finishing the setup. If this is not required now, remove the check from the checkbox. Then choose Next>. After all installation options have been fulfilled, to start the install, press again the Next> button. In up to a few seconds, the installation has been done. To finish the installer, choose the Close button. Note: As the cloud connector is registered and started as a Windows Service, we can start it later within the Administrative Tools/Services administration tool of Windows (service is named SAP HANA Cloud Connector 2.0), if we decide not to start it immediately. There, we can also do restarts of the service whenever this is needed. Now we connect the freshly installed cloud connector to the HCP developer account. Logon to the cloud connector administration UI by invoking the URL https://localhost:8443 in a Web browser. The cloud connector logon screen then is shown in the browser. As user and password, use the pre-defined user Administrator and password manage. As first step, select Master (Primary Installation) as the installation type. The other choice Shadow (Backup Installation) is used for a high availability installation of the cloud connector and not used in this context. After the first logon, the initial password needs to be changed. As next step, we need to connect the cloud connector with our developer account in the cloud. 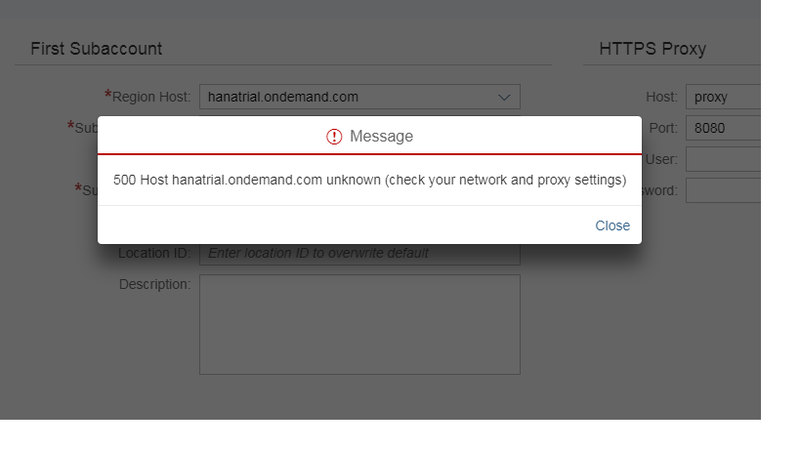 Make sure to select hanatrial.ondemand.com as Landscape Host, and specify our free developer account as Account Name. In case the cloud connector is located within a fenced corporate network that allows connectivity to internet resources only via a proxy, also specify the HTTPS proxy. Now the main page of the cloud connector administration UI shows up. In case the connection succeeded, we will see the Connector State with a yellow indicator as shown in the following screenshot. Now, we have a persistent SSL connection to our cloud account and are ready to use this connection in our cloud applications. This will be a simple sum calculator of two numbers. There will be a web url through which user will pass 2 numbers and will get the result as summation of the two given input. The summation logic will be written in a Function Module in IDES system(SAP ECC on-premise) and will be called from HANA Cloud through Cloud Connector. The java web application will be deployed and hosted on the Hana Cloud Platform and call the Function Module via the Cloud Connector. A sample Function Module – “ZDEMO_CAL_HCC” is written to sum of two numbers which are taking as input and result will be exported as output. Make sure Remote Enabled Function Module is clicked. Make sure to click on Pass Value for both the Import and Export parameters. Login to the Cloud Connector and Click on the Account Dashboard. It is observed that the account in Hana trial is already connected with a green status. We can add more accounts using add button. To allow the on-demand applications to access a certain back-end system on the intranet, this can be managed using the Cloud connector access control management. 1. Go to the Access Control tab page and Choose Add. 2. Internal Host and Internal Port specify the actual host and port under which the target system can be reached. It needs to be an existing network address that can be resolved on the intranet and has network visibility for the Cloud connector without any proxy. 3. Virtual Host specifies the host name exactly as it is specified as the URL property in the HTTP destination configuration in SAP HANA Cloud Platform. The virtual host can be a fake name and does not need to exist. 4. The Virtual Port allows distinguishing between different entry points of the back-end system. In addition to allowing access to a particular host and port, specifying which function modules (Resources) are allowed to be invoked on that host. All other RFC requests are denied by the Cloud connector. 1. To define the permitted function modules (Resources) for a particular back-end system, choose the row corresponding to that back-end system. A dialog appears, prompting to enter the specific function module name to allow. 2. The Cloud connector checks that the function module name of an incoming request is exactly as specified in the configuration. If it is not, the request is denied. 3. If selected the Prefix option, the Cloud connector allows all incoming requests, for which the function module name begins with the specified string. 4. The Enabled checkbox allows to specify whether that resource should be initially enabled or disabled. Connectivity destinations are part of SAP HANA Cloud Platform connectivity service and are used for the outbound communication of a cloud application to a remote system. They contain the connection details for the remote communication of an application. Connectivity destinations are represented by symbolic names that are used by on-demand applications to refer to remote connections. The connectivity service resolves the destination at runtime based on the symbolic name provided. The result is an object that contains customer-specific configuration details, such as the URL of the remote system or service, the authentication type, and the relative credentials. The currently supported destination types are HTTP, Mail and RFC. HTTP destination– provides data communication via HTTP protocol and is used for both Internet and on-premise connections. Mail destination – specifies an e-mail provider for sending and retrieving e-mails via SMTP, IMAP and POP3 protocols. RFC destination – makes connections to ABAP on-premise systems via RFC protocol using JCo as API. SAP HANA Cloud Platform applications can be based on the Java EE Web application model and hence can develop applications for SAP HANA Cloud Platform just like for any application server. Next steps are the process to develop the Application which will call the RFC in ECC. 8. Open the Eclipse IDE for Java EE Developers and switch to the Workbench screen. 9. From the Eclipse IDE main menu, choose File New Dynamic Web Project . 10. In the Project name field, enter the name of the Project. 12. In the Configuration pane, use the default configuration. 1. On the DemoCalculator project node, open the context menu and choose New Servlet . Window Create Servlet opens. 2. Enter the package and class name. 3. Choose Finish to generate the servlet. The Java Editor with the ConnectivityRFCDemo opens. 4. Change the doGet(…) method so that it receives the input from user, call the Function Module using the Destination created in HCP and result back to the user with the output. 1. Explore the DemoCalculator Project node, on the WebContent node, right click and choose New JSP File . Window Create JSP File opens. 2. Create two JSP File, one for the input of two numbers and another for the output file. 3. Here the two JSP file named Calculator.jsp and Result.jsp. 1. Open the servlet in the Java editor and from the context menu, choose Run As Run on Server . 2. The Run On Server dialog box appears. Make sure that the manually define a new server option is selected. 3. As server type, select SAP SAP HANA Cloud Platform . 6. On the New Server wizard page, specify the application name as mycalc (only lowercase Latin letters and digits are allowed). 7. From the Runtime dropdown box, select a specific runtime. If the Automatic option is selected, the server will load the target run-time of the application. 8. Enter the account name, user name, and password. 9. Choose Finish. This triggers the publishing of the application on SAP HANA Cloud Platform. 10. After publishing has completed, the Internal Web Browser opens and shows the application. 11. Once it is deployed on the HANA Cloud Platform, it can be monitored from the HCP Cockpit. Once the application is deployed in the HANA Cloud Platform, we can get the url from the HCP Cockpit to test it from the Browser. I know you are limiting this example to Windows, but I just want to mention that the SCC is also available for Linux and MacOS. Additionally, on Windows the SCC is also able to find a Java installation from the Registry, e.g. the Registry Key “HKEY_LOCAL_MACHINE\SOFTWARE\JavaSoft\Java Development Kit\CurrentVersion”. This key is usually created by the Java installation. If it points to an up-to-date Java 6 or 7 installation, the SCC will use it. Thanks a lot for the additional info. In one of our IoT demo we have a scenario to get the sensor values (from a remote weight sensor device) and need to send these values to a remote HANA DB (not the one attached with SAP HCP) . I couldn’t resolve this or no lead on how to do this. If you experts could shed some light on how to do this ! it is a great document for beginners, in this document you had provided the way to connect to SAP system but would please provide me some information if I have to connect to XSOData from hana system to fiori app in web ide where I am using proxy IP address to access my xsodata, fiori app and back end data. I don’t think that will be a fare decision to place CC in between HCI and PO where these (HCI and PO) can be connected without using CC itself. the comments to this document should only relate to the document. For support requests and problem reports I suggest that you open your own discussion thread in the Cloud Platform Developer Center forum. On step 3.1 (Login into Cloud connector with Administrator and manage) fails. Where would sum of two integer data will be stored?In ON-premise System or where? This example does not use any data storage, it’s only for illustrating communication. As I don’t have JAVA Quota in HCP,i couldn’t execute the above example.I would like to test Cloud connector on premise System with data storage or some other example. ?Any Suggestion please. Very useful tutorial. I’have done everything up to the servlet completion. It seems the source code is in a file Java Code: Attached in the file named “code.txt” but I’m not able to find the attachment: can you kindly help?. Is there a limit to how many backend SAP / non-sap systems the CC can connect to? where can i finde the code.txt? I wanted to add a Mysql datasource instead of ABAP system. Does anybody have an idea how can I it get done? One question: is there any minimum version for the SAP ERP to be so we can use the Cloud Connector? Could you please help me in how to establish the connectivity from Hana Cloud to On Premise BOBJ. I think we need to use cloud connector and rest part I am not sure. Also we are not very clear on Virtual Host – your document mentions Virtual Host specifies the host name exactly as it is specified as the URL property in the HTTP destination configuration in SAP HANA Cloud Platform – BUT – it doesn’t mention how to set up the URL property and what should be the basis of it. I have installed the cloud connector in my system. But when I open the https://localhost:8443/ I am getting an certificate issue. Can you help in resolving? One very basic question, when we order the server for the Cloud Connector (deployed in our DMZ) do we have to have a public IP address? Please, could you help me to clarify where I need to install de SCC? I need another server in the same Customer Private Network? Or I can install it in SAP ERP?